When you’re a pet parent, you’ve got to give a quick road trip or summer vacation a little extra thought. Do you board your dog in an overnight camp? Rely on a local petsitter, friend or relative? Or pack up your pooch and take him along for the journey? Option three requires a sense of adventure, common sense about leaving your pet alone in an unfamiliar place, pet etiquette and some advance research on pet-friendly hotel rules and restrictions. But with a combination of all of the above, it can be simple and fun to have your four-legged friend along for the ride. The biggest question when considering taking your pet along is finding dog-friendly hotels. Not to worry. Motel 6 is a dog-friendly hotel chain. Photography courtesy Motel 6. As locations are often independently owned, policies may vary by hotel, so inquire with the specific site to ensure it is pet-friendly before pulling in for the night. 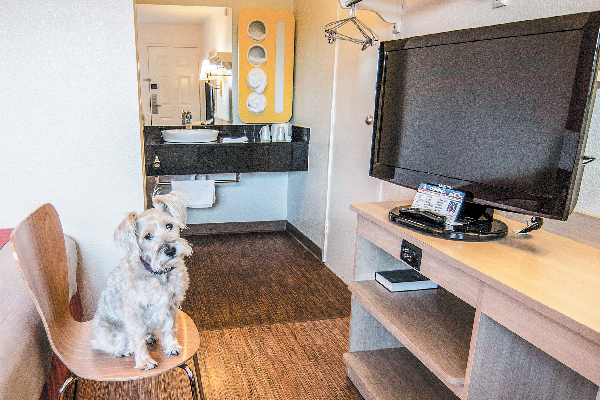 While some chains and locations charge a pet fee, others allow a complimentary stay. La Quinta, for example, allows two pets per room at no charge. Motel 6, likewise, claims that “well-behaved pets are always welcome,” and they stay free. Regardless of the chain, it’s a good idea to read the hotel’s pet policy before booking — and always be up front at check-in about having a pet in your room. You’ll likely be required to sign a pet policy agreement for the safety of everyone involved, from you and your dog to housekeeping and hotel staff. 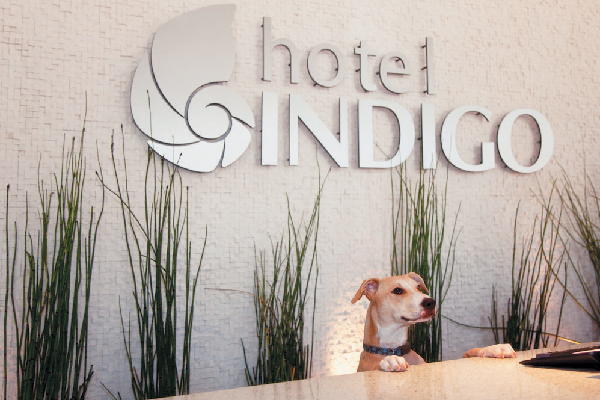 Hotel Indigo is a dog-friendly hotel chain. Photography courtesy IHG/Indigo Hotels. From Extended Stay America, Comfort Inn & Suites and Hampton Inn to the many hotel chains under the InterContinental Hotel Group umbrella — Holiday Inn, Kimpton and Hotel Indigo, among others — there are abundant hotel options in the midscale price category. Many of these hotels charge per-pet fees of $25 and up, but some also offer extra-special pet amenities to make up for the charge. Hotel Indigo, for instance, a boutique hotel chain with 53 locations across the United States from San Diego and Austin to Savannah and Chicago, is known to offer Yappy Hour events, where dogs are welcome in rooftop bars. The Ritz-Carlton, Laguna Niguel. Photography courtesy Ritz-Carlton Laguna Niguel. Even Fido deserves to stay in style. Thankfully, many upscale hotel chains will welcome him with open arms and treats. Check for additional costs like a pet fee (sometimes a refundable deposit, sometimes not) and a non-refundable cleaning fee. Chains like Hyatt and the hotels in the Starwood group — Aloft, Sheraton, Westin and W Hotels, among others — allow pets with certain weight and other restrictions. Westin will even offer Fluffy her own branded dog bed so her sleep can be as “heavenly” as her owners’. For the ultimate dog-friendly hotel destination, Southern California’s The Ritz-Carlton, Laguna Niguel offers the Posh Pooch program, which includes a hand-painted bowl, plush dog bed, chew toy, dog menu, dog walking trail map and Club Yappy card — a loyalty card that gives pet parents discounts on property throughout their stay — all for a $50 per-night boarding fee. This summer, the hotel will offer its series of monthly Yappy Hour events that benefit The Veterans Initiative of Canine Companions for Independence. “Over the years, Yappy Hour has not only been an exciting event that brings the local community and their dogs together, but it has raised significant funds in support of animal charities that change lives,” says Bruce Brainerd, general manager of The Ritz-Carlton, Laguna Niguel. In 2017, the property’s Yappy Hour events raised $83,500 for the dog-related charity — that’s truly something to shake a stick at. Airbnb has tons of dog-friendly accommodations. Photography ©GoodLifeStudio | Getty Images. 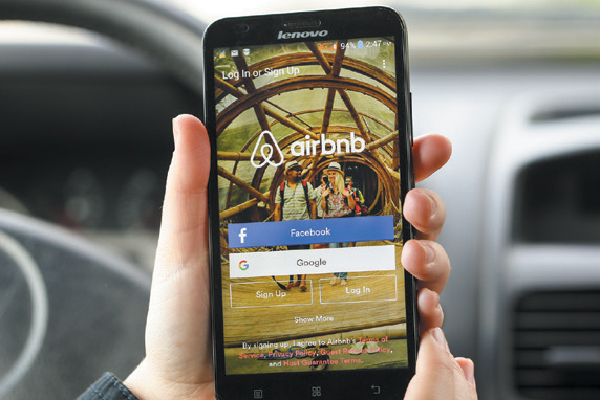 With the rising trend of temporary rental properties made popular by platforms like Airbnb and HomeAway, it’s easy to find alternative accommodations right at your fingertips. With possible pet-friendly benefits like a fenced yard or proximity to a welcoming neighborhood dog park, vacation rentals are a popular option for traveling dog owners. Check out airbnb.com or homeaway.com to view listings. Frequent traveler Jena Reilly of Georgia learned a few tricks of the travel trade thanks to her shepherd-husky mix, Tebone, whose in-room antics taught her what to look for when booking a hotel stay. “On one trip to Jekyll Island, Georgia, we booked a room at a dog-friendly Holiday Inn right on the beach. Our room had two doors — one to the parking lot and the other directly to the beachfront. On our first night, we walked to a restaurant nearby and left Tebone in the room. While waiting for our table, I got a call from the front desk. They had been calling all hotel guests to find out whose dog was wandering the lobby. Turns out, the doors had push-down handles instead of doorknobs. Tebone figured out how to push the handle and explore the lobby. 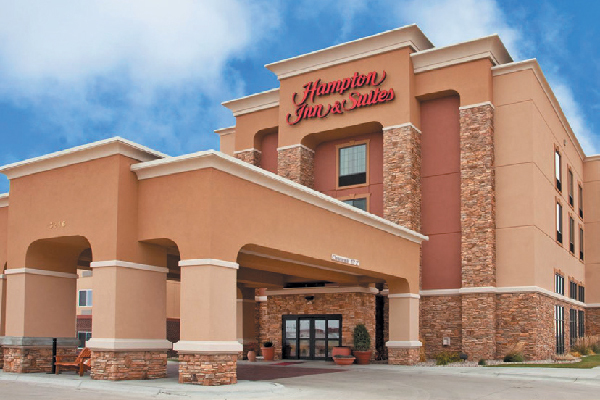 Hampton Inn & Suites is a dog-friendly hotel chain. Photography ©2018 Hampton. Get a room on the first floor for easy in-and-out access. Make sure there’s a safe, walkable place to take your dog to use the bathroom. Ensure none of the doors in the room close on their own, to prevent your dog from getting trapped and anxious. Always travel with your dog’s own bed, blankets and toys to give him a sense of “home” away from home. Christina Orlovsky Page is a San Diego-based writer and former editor of San Diego Pets Magazine. An active volunteer, she has a soft spot for senior dog rescue. She is privileged to share her home with three adopted pups, Toby, Tilly and Frankie. Thumbnail: Photography ©Solovyova | Getty Images. The post Dog-Friendly Hotels to Keep in Mind for Your Summer Vacation appeared first on Dogster.